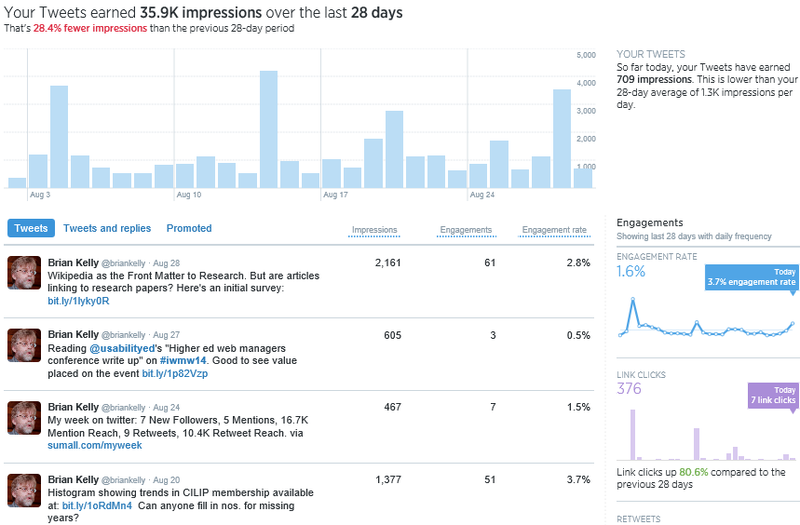 As illustrated the service provides statistics on tweets (potential impressions, engagement and engagement rate). Additional tabs provide information on followers (changes in the numbers of followers and profiles of their gender, location and interests) and Twitter cards. If you don’t use Twitter, make small-scale use of the tool or use it purely for social purposes you probably won’t have an interest in what the analytics may tell you about your use of the tool. However increasingly researchers will have an interest in use of alt.metrics measures which provide indications of interest in their research outputs. In additional research support librarians will have an interest in this area in order to support and advice their users. Finally, those involved in digital marketing are likely to be interested in the information provided by this new service. There are, of course, a number of other Twitter analytics tools. I use Tweetstats which, as illustrated, provided a display of the locations of one’s followers. 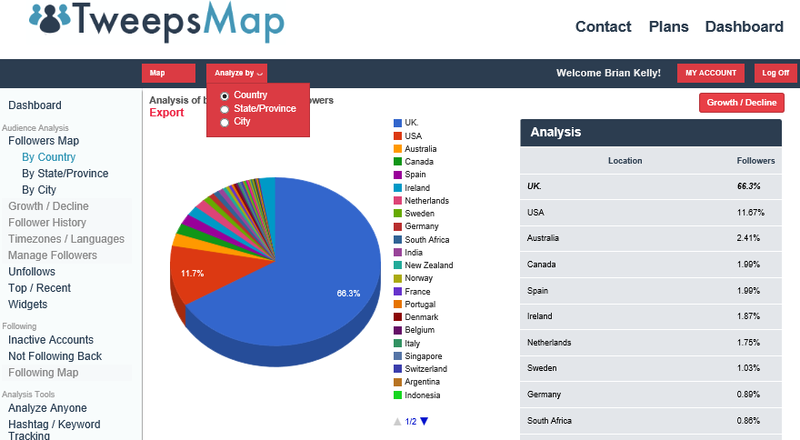 The free version of the tool also provides information on inactive Twitter followers and other profiles of one’s followers, although subscription to the premium service is needed for the full range of services. 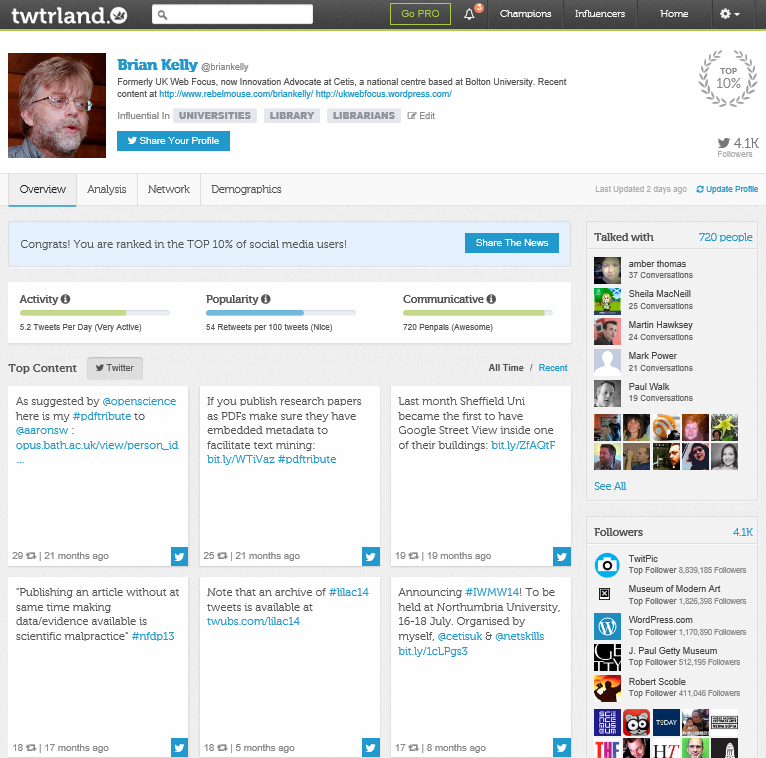 The other tool I use is Twtrland. I receive a weekly email summary from this service but I’ve not logged in to the dashboard for some time but, as show, the free version does appear to provide a comprehensive set of information. Finally I should mentioned Social Bro. I’ve used this tool in the past and found that the free version was useful in providing recommendations on the best time to tweet and in profiling my followers’ community (e.g. I found that people I follow typically tweet on a daily basis, publish between 1 and 5 tweets daily and follow between 100 and 500 Twitter accounts. This, for me, was a particularly useful insight into ‘normal’ Twitter use patterns and helped confirm my belief that to make effective use of Twitter to support one’s professional interests you will need to achieve a critical mass for your Twitter community. Unfortunately the free version of this service is only available in you have a total Twitter community (your followers and the accounts you follow) which is less than 5,000. Since my community exceeds this by a few hundred I am not able to give an update on the information the tool currently provides, but I did find it useful when I first used it. This entry was posted on 1 Sep 2014 at 1:07 pm	and is filed under Evidence, Twitter. You can follow any responses to this entry through the RSS 2.0 feed. You can leave a response, or trackback from your own site. I usually use the free version of Twitonomy. I’ve posted a few thoughts on Twitter Analytics here: http://eventamplifier.com/2014/09/01/twitter-analytics-events/ – including more detail on Twitonomy and my initial thoughts about how Twitter Analytics could be used to support amplified events. As ever, Brian Kelly is on the ball when it comes to measuring social media reach. Thanks @Briankelly!